Over the last few days I am breaking both of these rules, you will have noticed that there have been a couple of days where there have been 2 posts, I'll be perfectly honest, it's because I wouldn't have achieved my blog goal if I hadn't! 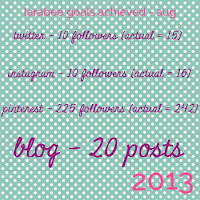 I'm not going to regularly post my blog goals and achievements, mainly because its boring to everyone else and in the grand scheme of things my achievements are very small compared to other people's, I understand that and don't want to put you off! 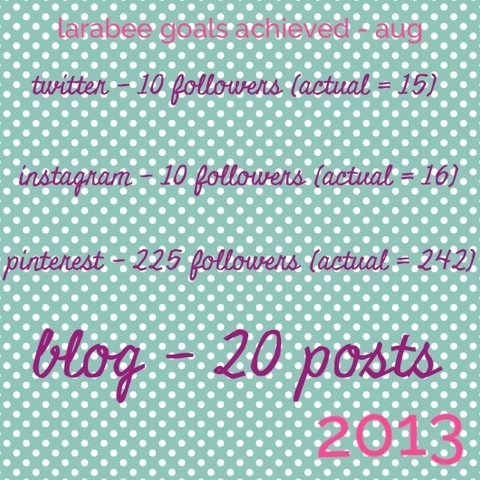 But... at the moment I'm finding it inspiring and I needed an extra blog post to reach my 20 so here it is!!! I've 'met' some really inspiring people online this past month and feel incredibly motivated by the comments, likes and re-pins I've had on social media thank you for that, its very much appreciated and means a great deal to me. I know I have a long way to go with blog design, content and quality of writing and photos, but I'm trying and I'm loving it! Have a lovely weekend and thank you so much.